Editor’s Note: As the international community seeks to negotiate a new climate treaty to be completed in Paris in 2015, negotiations have been taking place during the last two weeks in Bonn, Germany as one of the sessions on the road to Paris. Today’s guest blogger, Dr. Idil Boran, from York University in Canada has submitted the following report on progress in Bonn during the first week. A central issue of concern in these negotiations is the need of nations to take equity and justice seriously when they make ghg emissions reductions commitments and when considering their responsibility for adaptation, losses and damages in poor vulnerable countries. Among close observers of the negotiations and the science informing these talks, there is widespread agreement that there is little hope of keeping warming to tolerable levels unless high-emitting nations base their emissions reductions promises on what equity would require of them. The June sessions of the United Nations Framework Convention on Climate Change (UNFCCC) is taking place in Bonn, Germany, June 4-15, 2014. This is one of the “intersessional” meetings that take place at various times during the year between the meetings of the Conference of the Parties (COPs) annually held at the end of each year. This year’s intersessional meetings are of special importance, the June session currently under way being a critical one. This is because multilateral negotiations on climate change are on a track to reach a comprehensive and legally binding agreement by the 21st session of the Conference of the Parties (COP 21), to be held in Paris at the end of 2015. But more importantly, everything to be agreed upon at COP 21 must be drafted at COP 20 the year before, that is in December 2014. It is the present intersessional meeting – taking place in June in Bonn – where the hard work needs to be done, so that all the substantive recommendations can be presented, negotiated, and drafted in Lima. In this spirit, the UN Climate Change Conference convened on June 4 with determination to achieve as much as possible before Lima. At this point in time, the negotiations are at an important juncture. The goal for the international community is to draw lessons from the Kyoto Protocol era, and to articulate the terms of an entirely new system of cooperation for the Post-Kyoto era. In other words, the goal is to avoid the weaknesses of the Kyoto Protocol. Given that the Kyoto Protocol was motivated by a well-defined conception of equitable distribution of responsibility, many questions arise at this juncture over how equity will be defined within the new agreement. Equity has always been central to multilateral negotiations on climate change. This makes sense for many reasons. First, climate change is expected to affect lives in important ways. Second, the way in which people’s lives will be affected is expected to be more severe in some places than others. Third, climate change is a phenomenon that is associated with human activity, which has been going on for some time and which is intertwined with economic development and growth. For these reasons alone, it becomes obvious to anyone with a sense of fairness that – to the extent that the international community is to cooperate on addressing the effects of climate change – the terms of cooperation ought to be fair. The terms of cooperation set by the Kyoto Protocol were devised in light of the principle of “common but differentiated responsibilities”. Given that industrialized nations are responsible for the problem of climate change, the idea was to adopt an allocation of responsibilities that requires developed nations to take up the bulk of the burden. This gave rise to roughly two categories of nations: those who are to assume the costs of curbing climate change by contrast to those who are not expected to do much. But this structure also became highly divisive and unable to generate agreement and compliance, which is desperately needed for action on climate change to be effective. As part of the new rounds of negotiations, the UNFCCC adopted the Durban Platform for Enhanced Action at COP 17 in Durban in 2011, where negotiations were put on an ambitious track to work out the details of an entirely new international agreement by 2015. When it was first put in place, the Durban Platform did not include too many substantive decisions, for the objective was to allow the terms of international cooperation to be discussed and decided upon through negotiations from 2012 to 2015. The single prior decision that was made, however, was the rejection of the principle of “common but differentiated responsibilities” and the adoption of a principle of “universality” instead, as the central guiding principle of a post-Kyoto agreement. On this principle, all nations are to contribute to the cooperative scheme on climate change in some capacity. This shift gave the international community the opportunity to have a fresh start and to rethink the terms of cooperation on a (relatively) clean slate. Additionally, the new international agreement under negotiation is one that is expected to have a richer composition than the Kyoto Protocol. The Kyoto Protocol was focused exclusively on mitigation through reduction of emissions. The new agreement is expected to have both a mitigation component and an adaptation component. Within the adaptation component, an International Mechanism on Loss and Damage associated with climate change impacts in developing countries vulnerable to the effects of climate change is being negotiated as well. This is an entirely novel issue under negotiations, and one with important implications for the philosophical, legal, and ethical aspects of international cooperation. In short, this broader range of issues adds significant dimension to the talks. The principle of “universality” may well be more suitable for this new round of negotiations, as the allocation of responsibility may need to be customized to each specific issue. Contrary to what might seem at first blush, the principle of “universality” need not require every nation to assume exactly the same amount of costs and responsibilities for a given issue. So far, no one has suggested that. Negotiators are discussing how to achieve equitable conditions within a system of cooperation for each issue. Take the discussions on the Warsaw International Mechanism on Loss and Damage, adopted recently in Warsaw in November 2013. As the issue is still in its earlier stages, the discussions are mostly over procedural matters at this point. But the question of equity arises nevertheless, and remains a central concern. For example, representatives of countries that are particularly vulnerable to the threat of loss and damage associated with the adverse effects of climate change, such as the members of the Alliance of Small Island States (AOSIS), want to see greater representation of these countries in the decision-making body. There is an equity argument that motivates this request. A competing argument is that the advisory and decision-making bodies on this matter will secure more appropriate decisions if they are composed of members with the appropriate expertise, which may or may not align with regional or national affiliations. This argument, which is also motivated by a sense of justice, suggests that the expert-based composition will be conducive to decisions that would maximize the benefits to those whose interests are at stake. How the discussions will unfold is yet to be seen, but the general parameters of the negotiations are such that equitable terms are to be discussed and tailored. The concept of “equity” is neither a monolithic nor an inert concept. It often needs to be formulated from within the concrete circumstances that make it relevant. Sometimes, equitable conditions devised for specific circumstances can become obsolete if circumstances change, and may need to be rethought and reformulated. Seen in this way, equity is not lost in this new round of negotiations, it is being worked out as new issues arise. Since any decision coming out of these negotiations will set precedents for future debates on international relations, it is important that the international community take the time to think through, and to carefully consider various (and sometimes conflicting) arguments, leaving no stone unturned. The advantage of the present round of negotiations is that there is a general motivation to advance the debates in a productive way, and to reach a genuinely effective and mutually acceptable agreement. 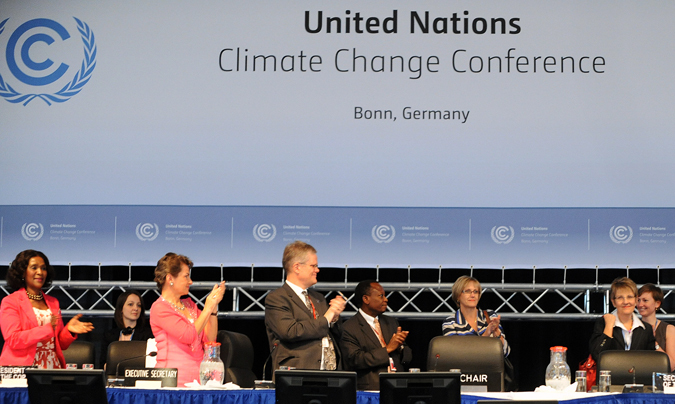 How the talks will unfold in the second week of the June session at the UNFCCC will set the tone for the Conference of the Parties (COP 20) in Lima. And for anyone interested in the philosophical, legal, and ethical dimensions of public policy and international cooperation, a close examination of the dynamics of the negotiations is worthwhile. On the Extraordinary Urgency of Nations Responding To Climate Change on the Basis of Equity. This article seeks to explain in understandable terms why nations must not only aggressively respond to climate change but respond at levels required of them by equity if the world is going to have any hope of avoiding dangerous climate change. And so, this article seeks to help citizens around the world understand why their nations must create climate change policies consistent with their equitable obligations and that if their nations fail to respond on the basis of equity, there is vey little hope of an adequate global solution emerging that has any potential of avoiding catastrophic climate change. Once again there has been some renewed interest in responding to climate change this week in response to the announcement by the National Oceanic and Atmospheric Administration (NOAA) that carbon dioxide (CO2) atmospheric concentrations have reached 400 ppm (parts per million). This concentration of CO2 is not only higher than experienced in the last 3 million years of Earth’s history (Kunzig, 2013), it is additional evidence that the world is rapidly running out of time to prevent dangerous climate change. 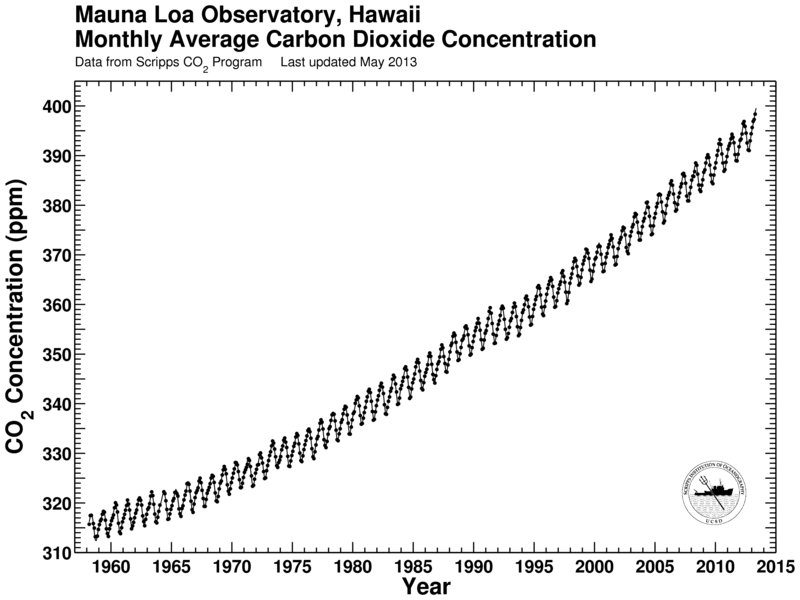 NOAA posted on its website Wednesday night, May 9, that the daily average for CO2 was 400.03 ppm. (Kunzig, 2013) The last time the concentration of the CO2 reached this mark, horses and camels lived in the high Arctic and seas were at least 30 feet higher. (Kunzig, 2013) This sea level rise would inundate major cities around the world and cause harm to hundreds of millions around the world when temperatures finally responded to these elevated greenhouse gas (ghg) atmospheric concentrations. Although this story made it to the front page of the New York Times, (see Schuetze 2013), the US press continues to fail to educate American citizens fully about the seriousness of the problem that the world is facing particularly in regard to the urgent need of nations to take immediate steps to reduce their emissions to their fair share of safe global ghg emissions. 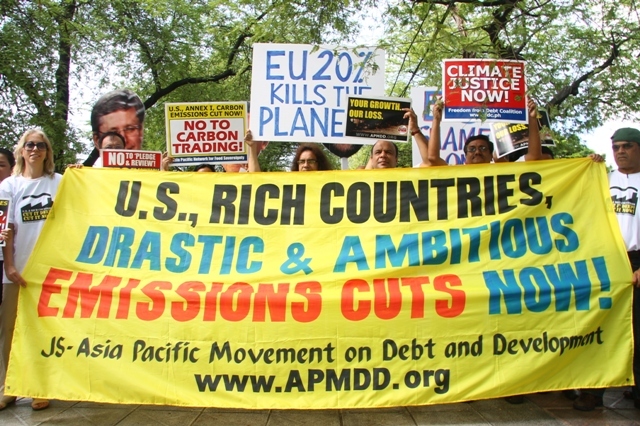 Ethicsandclimate.org has previously examined the failure of the US press to communicate to American people the importance of the equity issue in formulating US policy. (See, The US Media’s Grave Failure To Communicate The Significance of Understanding Climate Change as A Civilization Challenging Ethical Issue.Yet, as we will explain, in light of the rapidly decreasing amount of time remaining for the world to prevent dangerous climate change, there is now more than ever a need to increase political support at the national level around the world for the adoption of policies on climate change that reflect each nation’s fair share of safe global emissions. The importance of each government entity’s responsibility to limit their emissions to their fair share of safe global emissions has become undeniably obvious to most observers of international climate negotiations now that it has become clear to all that there is precious little time for the global community to avoid dangerous climate change. 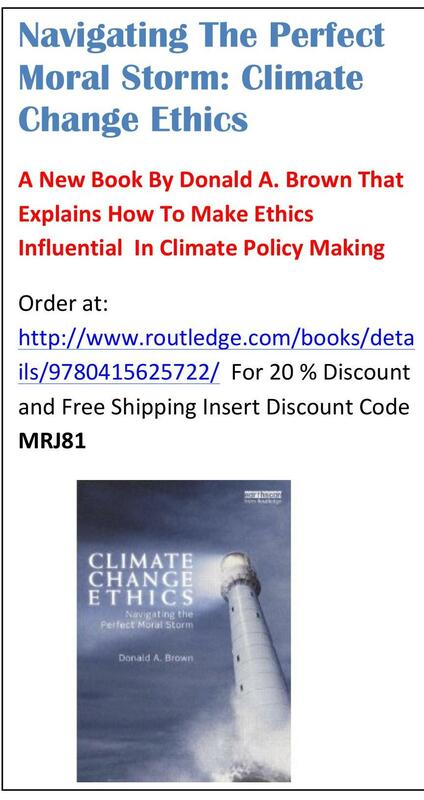 The central importance of the need to get nations to respond to climate change on the basis of “equity” becomes very obvious once a number of scientific aspects of climate change are fully understood. However, too few people understand these scientific aspects of climate change and the press is failing to educate citizens about these issues. To fully understand the importance of national responses on the basis of “equity” it is necessary to understand some features of climate change that make it unlike any other environmental problem facing the world. The atmosphere is like a bathtub, it has limited volume. Nations have been filling up the atmospheric bathtub since the beginning of the industrial revolution in the late 1790s. Because CO2 is long-lived in the atmosphere, the bathtub continues to fill up with CO2 even if rates of CO2 emissions slow down somewhat unless all ghg emissions are reduced to the rate at which the Earth’s natural carbon cycle can remove CO2, an amount which is less than 20% of existing emissions levels. Decreasing ghg emissions does not prevent global atmospheric concentrations from increasing unless they are cut back globally by huge amounts. And so to prevent dangerous climate change nations have to do much more than cut back on the ghg emissions levels that they are entering the atmosphere, they have to cooperate to prevent the level in the bath tub from reaching levels that will cause dangerous climate change. As we shall see, this is a level that the world is fast approaching. Furthermore because CO2 is well mixed in the atmosphere it makes no difference where on Earth the ghgs come from, the atmospheric concentrations of ghg continue to rise without regard to location of the source of emissions. What makes the current climate change threat so ominous is that the levels of CO2 that have been building up for over 200 years are quickly approaching levels that could trigger dangerous climate change as emissions are increasing in many parts of the world. In our experience, most Americans don’t understand the scale of the climate change facing the world. In Copenhagen in 2010 the international community agreed to set as a goal warming limit of 2°C not withstanding there are some scientific evidence to believe that the warming limit should be lower at 1.5 °C. The 2°C warming limit was chosen because there is strong scientific evidence that warming above 2°C could trigger rapid nonlinear climate change thereby threatening hundreds of millions of people around the world and the ecological systems on which they depend. Even if 2°C warming doesn’t trigger nonlinear warming, this amount of warming will cause great harm around the world to people and places that have done little to cause climate change. The following graph describes the staggering challenge facing the world if the international community desires to limit warming to 2°C. The graph depicts three different emissions reductions pathways where the steepness of ghg emissions reductions needed to limit 2°C depend upon when global emissions levels peak, that is in 2015, 2020, or 2025. Despite over twenty years since the international community agreed in 1992 to adopt policies and measures based upon equity to prevent dangerous climate change, global ghg emissions levels continue to rise despite a global economic turn down in 2008. Global CO2 emissions grew 3 percent in 2011 and were estimated to rise 2.6 in 2012. (Morello, 2012). Since the international community began to negotiate a climate change solution, rather then emissions levels diminishing they have grown to 58 percent above the 1990 emissions level in 2012 (Morello, 2012). And so, the world is facing the urgent need to reduce ghg emissions at hard to imagine rates as seen in the following graph where the different colored lines on this chart represent different assumptions about climate sensitivity. This graph shows that if the world waits to act together to prevent ghg emissions from rising until 2020 or 2025, the world will need to reduce ghg emissions at staggering reduction levels after the peak years. Once one identifies an atmosphere ghg concentration level that will serve as a goal for preventing dangerous warming it is a relatively straightforward calculation to identify the remaining amounts of ghg emissions that can be emitted worldwide to prevent atmospheric ghg concentrations from exceeding the maximum concentration goal. This calculation is the basis for determining an emissions budget. Because there is some uncertainty about climate sensitivity, that is how much warming the Earth will experience at different atmospheric ghg concentrations, different atmospheric ghg concentration goals create different levels of probability of limiting warming to 2°C. The following chart identifies the quantity of ghg emissions in gigatons of CO2 equivalent that the world may emit to achieve different levels of probability that the 2° C warming limit will not be exceeded. 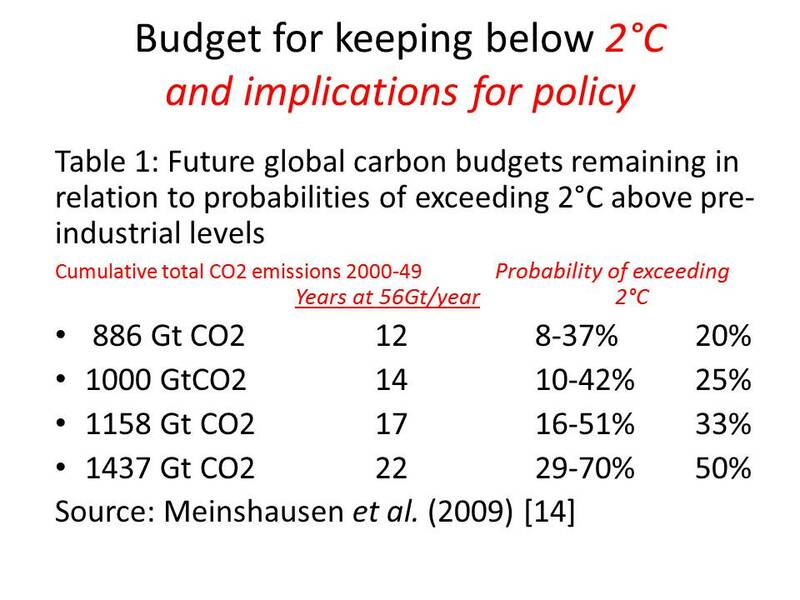 Therefore we see from this chart that if the entire world is assumed to be allowed to emit no more than 886 gigatons (Gt) of CO2 equivalent, this budgetary limit creates between a 8% and 37%, with a best estimate of 20%, probability that temperatures will exceed the warming limit of 2°C. At the upper end of this chart, a 1437 Gt CO2 budgetary limit creates a probability of between 29 to 70 probability, with a best estimate of 50%, that the 2°C warming limit will be exceeded. The chart also shows that if the world emits ghgs at levels projected at 56 Gt per year, then, assuming that the world chooses to live with a budget of 886 Gt CO2 which gives the world an 80% probability that future warming will be limited to 2°C, then after12 years there will be zero emissions left in the budget. The chart also demonstrates that even if the world chooses to run the risk of accepting a 50% probability that the 2°C warming will be exceeded then world can only emit greenhouse gases at projected levels for 22 years. As gloomy as this picture in regard to the remaining global ghg emissions budget, we have not yet explained why getting nations to commit to reduce their emissions to levels required of them by equity is so important and indispensable for thinking clearly about how the world must respond to the threat of climate change. And so, now, for the first time, we can explain the importance of “equity” in guiding international responses to climate change. 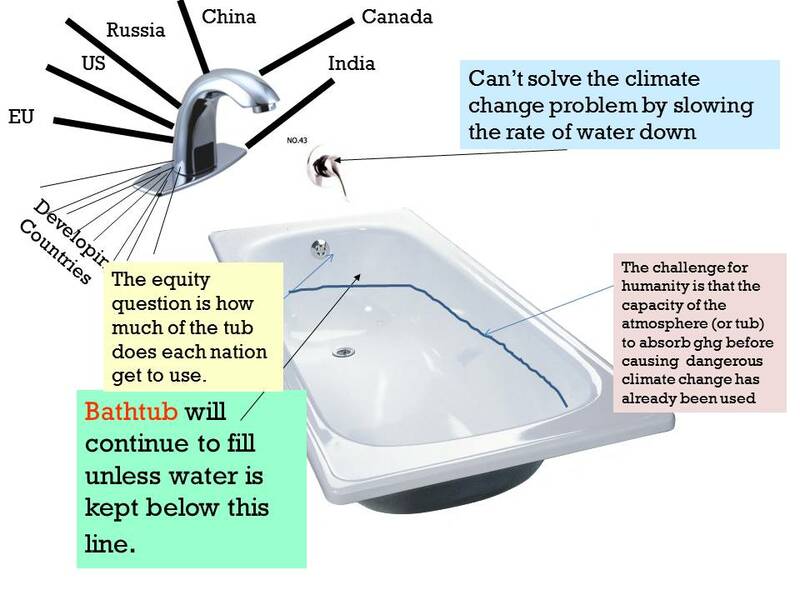 Returning to the use of a bathtub as a metaphor for the atmosphere, we note that there is already elevated levels of ghg (metaphorically water) in the bathtub that have risen to current levels from over 200 years of human activities. 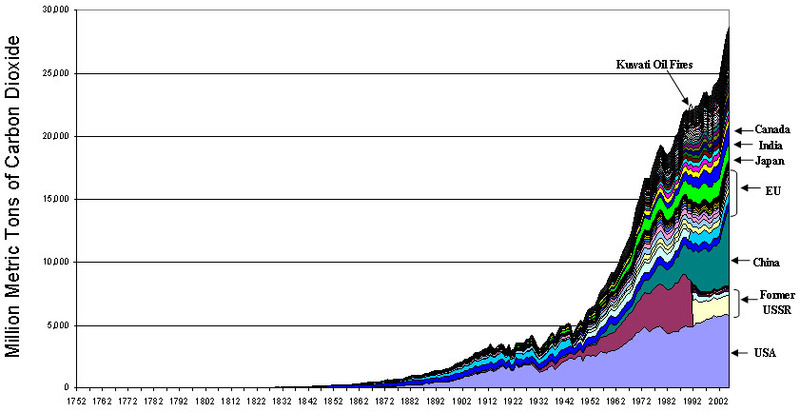 That is CO2 has increased in the atmosphere from 280 ppm to 400 ppm since the beginning of the industrial revolution. If we assume that atmospheric concentrations of CO2 equivalent should be limited to 450 ppm to give the world a 50% chance of keeping warming from exceeding the 2°C warming limit, atmospheric concentrations have increased already by120 ppm from pre-industrial levels and only 50 ppm of atmospheric space are left to allocate to the entire world. The 120 ppm increase in atmospheric CO2 concentrations that has already been put into the bathtub by human activities has overwhelmingly been caused by activities in some rich, developed countries much more than poor developing countries. The following chart shows which countries have contributed the most elevated concentrations of CO2 in the atmosphere. And so some countries more than others have contributed far more than others to elevated ghg concentrations. Given that there’s only 50 ppm of atmospheric space left to allocate (assuming and atmospheric goal of 450ppm giving approximately a 50 % chance of exceeding the 2°C) and some developing countries desperately need to use the remaining atmospheric space to escape grinding poverty, it is obviously unfair or inequitable to require all countries to reduce emissions by the same amount. Furthermore, the above chart demonstrates that some countries including the United States, Canada, and Australia, for instance, far exceed others in per capita levels of emissions from their citizens compared to other countries such as India. If it is determined that the entire world must reduce its emissions by 80% below 1990 levels to prevent dangerous climate change, high-emitting nations or governments around the world, including the US, Canada, and Australia, will need to reduce their emissions to even greater levels on the basis of equity and fairness. To require each nation or government to reduce emissions by the same percentage amount would freeze into place unjust emission levels for high-emitting governments and very low emissions rates for poor developing countries. For this reason, almost all the nations of the world, including the United States in 1992 when it ratified the UNFCCC, agreed that each nation must reduce its emissions on the basis of “equity” to prevent dangerous climate change. (UNFCCC, 1992: Art 3, Para 1) If all nations need only reduce their emissions by equal percentage amounts, then a high-emitting nation like the United States that emits ghg at rate of 17.3 tons per capita would be allowed to emit at a level 10 times more per capita than a country like Vietnam that emits 1.7 tons of ghg per capita. (World Bank, 2012b) As a result, all nations have agreed that national targets must be based upon fairness or equity. Given that the entire world has only 50 ppm of atmospheric space left to allocate to give the world a reasonable expectation of preventing dangerous climate change, the equitable and fairness dimensions of national ghg emissions reductions commitments become obvious and crucial to increasing the ambition of nations to reduce their ghg emissions. Yet most citizens seem completely unaware of the equity issues entailed by climate change and many high-emitting nations are ignoring their equitable responsibilities. However, the ability of nations to ignore what equity requires of them will become more and more difficult as the world wakes up to the hard-to-imagine stringent carbon budget that the world must face to avoid catastrophe warming. In addition the longer nations wait to respond to climate change on the basis of equity, the more difficult it will be in the future to do so because the steepness of their emissions reductions pathways needed to comply with what equity requires increases the longer nations wait to respond appropriately.